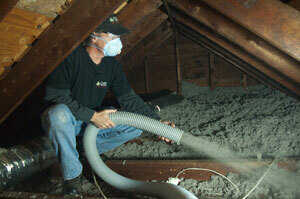 Insufficient or underperfoming attic insulation is one of the most common home energy problems in the country. When your attic isn't properly air sealed and insulated, air easily passes through and disrupts the effectiveness of your HVAC system and the comfort of your home. In the winter, your home loses heat through your ceiling drywall to very cold attics, causing your heating system to run longer to heat the home while creating uncomfortably cold temperatures throughout the house. The problem reverses in the summer, when extremely hot attics heat up the rooms below and force your air conditioning system to work harder. Attic Systems can help you solve these problems with an attic insulation upgrade. Our complete insulation services will ensure that your living space isn't affected by temperatures in your attic, making your home more comfortable and saving you money. Call us today to learn more about how we can help you! Uncomfortable rooms: Rooms that are too hot in the summer and too cold in the winter are a sure sign of an insulation problem. Insulation prevents air flow between the attic and the living space, ensuring that the air you pay to heat and cool stays in the house, while very hot or cold air in the attic doesn't affect the home's comfort. Improving insulation will help keep your entire home at a more comfortable temperature. High heating & cooling bills: When your home is under-insulated, your HVAC system has to work even harder to keep it at the temperature you want. This naturally wastes energy and causes you to experience higher heating and cooling bills. By improving insulation, you can limit the amount of energy used to heat and cool your home and save money. Drafty rooms or uneven temperatures: Many homeowners deal with one or two rooms in the house that are always a different temperature than the rest of the house. A common source of this issue is insufficient air sealing, which allows conditioned air to escape and exterior air to filter in. Proper air sealing followed by upgraded insulation is a smart solution for this problem. Visibly inadequate insulation: Not sure if you have enough attic insulation? Many times it's readily apparent. The U.S. Department of Energy recommends having between 13-18 inches of insulation, depending upon your local climate. According to the Insulation Institute, 90% of homes in the U.S. are under-insulated, and there's a good chance yours is too. If you're tired of dealing with uncomfortable rooms and high heating and cooling bills, Attic Systems can help! Our proven, effective attic insulation system will keep the air you pay to heat and cool in your living space and make your home more comfortable throughout the year. Contact your local dealer today to learn more about we can help you save money through attic insulation and air sealing!